When we are challenged with stillness and sitting and really experiencing reality for a moment without distraction, it often makes us uncomfortable. Many times, we choose actions to numb ourselves rather than sit in stillness and feel our emotions in the moment. This is not something we necessarily need to control all day every day, but we need to be mindful of how we numb because the actions can quickly become overwhelming habits and eventually turn into addictions. 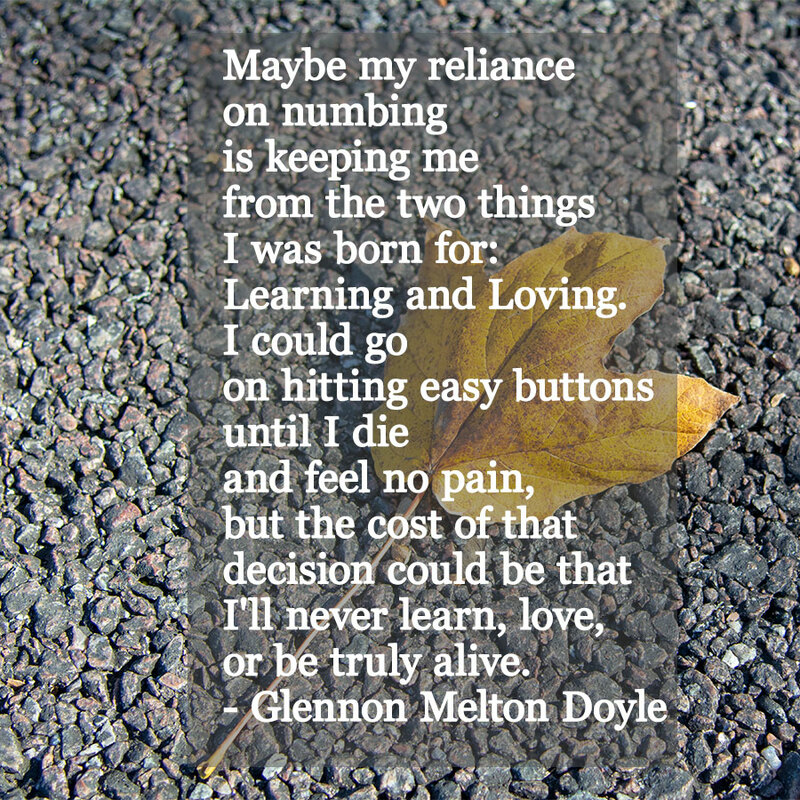 Glennon Melton Doyle discuss the use and detriment of constantly using our “easy buttons” to numb ourselves. These are the things that we reach for when we feel uncomfortable. They are usually readily available and seem to come so easy. Anything can become an unhealthy habit. When these actions become our “normal” and expected behavior it can be hard to quit when we they become an overwhelming habit. I’ve witnessed this with having a drink at the end of a long, hard day. We think we can use a drink to decompress. Then the end of the next day comes and we think, “I can really use a drink”, only our day wasn’t that hard or long. It has now become a way to numb our feelings. Do you ever pick up your phone, look at it, and think “hmmm what should I look at or do with this thing?” You had no reason to pick up your phone, but it makes you feel more comfortable and safe to be distracted with something rather than having to sit in stillness and feel your emotions and intentionally decide what to do next. Our phones have made numbing very easy and easily repeatable. I encourage you to be mindful of your easy buttons. Look for behaviors you go to when you’re feeling uncomfortable. Here is an exercise you can use to become more aware of our easy buttons. I am using phones as an example, but you can alter this to include any seemingly habitual things you are doing to numb. Each time there is a break between tasks or time for a breath, pay attention for what you are reaching for. You can use your phone for practice. Set a timer for an hour and get a sticky note and place it on the back of or next to your phone. Each time you pick up your phone make a mark on the paper. At the end of the hour, see hour many times you picked up your phone, then reflect on how many times you picked it up for a legitimate purpose. No judgement here. We are just noticing. Does it seem excessive? If you were to guess, how much time did this add up to in the hour? Do you feel taking this action enhances your day? Next, set your timer for another hour, and during this hour when you feel the need to reach for your phone pause for a second, take a nice deep breath, inhale and exhale, then notice where in your body you can feel your emotions. Sometimes, when we find and notice these emotions, we will tense up, hold our breath and try to not feel them but this only traps them in our body. Once you find the emotions, encourage yourself to pause and let the emotions flow through you. Keep breathing and take another few seconds to breathe and feel. After this, if you still feel the need to pick up your phone you can, but do so intentionally and know you are making the active choice. We can find many ways to numb ourselves, and sometimes it is acceptable to numb, but without being mindful and intentional about our choices it can be detrimental especially in the long term. Remember, it’s okay to feel uncomfortable. It’s okay to not immediately have a next action to take, and it’s okay to feel those uncomfortable emotions. Becoming mindful to the ways we numb can help us ensure we practice them in healthier ways.